Lynnfield was the first Intel CPU to aggressively pursue the idea of dynamically increasing the core clock of active CPU cores while powering down idle cores. The idea is that if you have a 95W TDP for a quad-core CPU, but three of those four cores are idle, then you can increase the clock speed of the one active core until you hit that TDP limit. 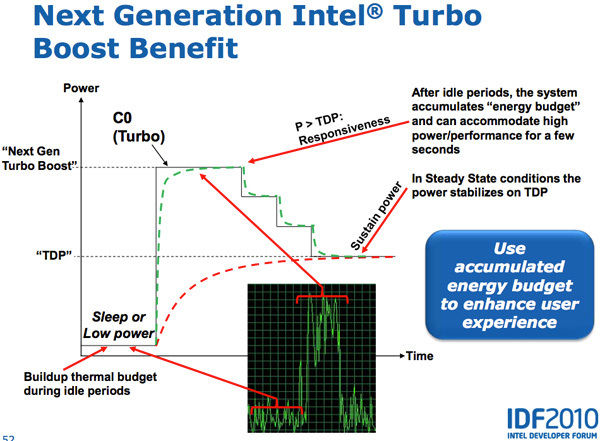 In all current generation processors the assumption is that the CPU reaches that TDP immediately upon enabling turbo. In reality however, the CPU doesn’t heat up immediately - there’s a period of time where the CPU isn’t dissipating its full TDP - there’s a ramp. Sandy Bridge takes advantage of this by allowing the PCU to turbo up active cores above TDP for short periods of time (up to 25 seconds). The PCU keeps track of available thermal budget while idle and spends it when CPU demand goes up. The longer the CPU remains idle, the more potential it has to ramp up above TDP later on. When a workload comes around, the CPU can turbo above its TDP and step down as the processor heats up, eventually settling down at its TDP. While SNB can turbo up beyond its TDP, the PCU won’t allow the chip to exceed any reliability limits (similar to turbo today). 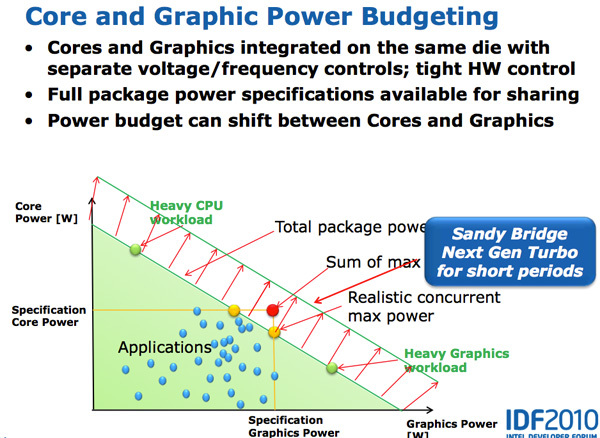 In addition to above-TDP-turbo, Sandy Bridge will also support more turbo bins than Nehalem/Westmere. Intel isn’t disclosing how much more turbo headroom we’ll have, but the additional bins are at least visible with multiple cores active. Current designs usually only turbo up one or two bins with all four cores active, I’d expect to see another bin or two there and possibly more in lighter load cases. Both CPU and GPU turbo can work in tandem. Workloads that are more GPU bound running on SNB can result in the CPU cores clocking down and the GPU clocking up, while CPU bound tasks can drop the GPU frequency and increase CPU frequency. Sandy Bridge as a whole is much more dynamic of a beast than anything that’s come before it.